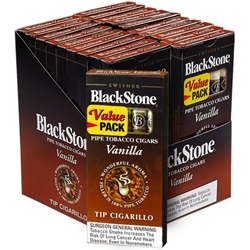 BlackStone Mild Vanilla Tip Cigarillo Cigars are made with a select blend of pipe tobacco and offer satisfying, mellow, and relaxing flavors with pleasurable tastes of vanilla and classic tobacco with an intoxicating aroma. Packaged in handy packs of plastic-tipped cigars, perfect for those on the go. Try them here today at Smokers Discounts!